Once she is the water, Selena Zou feels she is never racing against someone else, only herself and the clock. This is the explanation she provides when we ask her why she loves swimming. A native of Ottawa, Zou has been training and competitively swimming for the last five years with the Kingfisher swim club in Ottawa. “Swimming for me isn’t about being someone else, it is about being a better version of myself,” she said. Zou competes in local competitions with her swim club. If she participates in competitions outside of Ottawa, she will compete in the butterfly, freestyle and individual medley events. “My favourite events are the 100-metre butterfly and 100-metre freestyle, because they allow me to keep my pace while pushing as hard as possible right from the start,” she said. The 15-year-old hard of hearing swimmer attends Lisgar Collegiate Institute in Ottawa. Her weekly schedule is very busy. On top of attending school, Zou is also involved in extracurricular activities, such as trivia, debate and piano. She swims five to six times a week, which is four mornings and two afternoons. She also trains twice a week outside of the pool. Zou took part in her first international competition with the National Deaf Swimming Team at the 2017 Summer Deaflympics in Samsun, Turkey. “My best memory in swimming is at the 2017 Deaflympics, because I was very excited to swim on an international level with teammates, who share the same challenges as me as Deaf or hard of hearing individuals. It is one of the best feelings I ever had to experience!” said Zou. 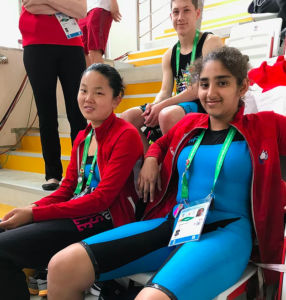 The World Deaf Swimming Championships will be held in August 2019 in Sao Paolo, Brazil and Zou is already preparing for her event, and so is the Canadian team. She would like to improve her personal bests in the freestyle and individual medley events.